The What: At InfoComm 2018, Just Add Power (J+P) unveiled the 725POE 2GΩ/3G+ SDI Power over Ethernet (PoE) transmitter, which is designed to enable a scalable approach to adding SDI video sources to a 4K system. The What Else: The 725POE 2GΩ/3G+ SDI PoE transmitter provides SD-/HD-/3G-SDI format support to Just Add Power’s 3G HD over IP system. 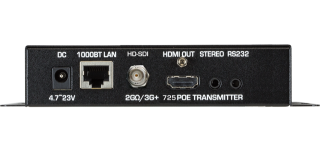 Eliminating the need for an SDI-HDMI converter in the IP video distribution chain, integrators have the flexibility to add an SDI source to their 4K infrastructure. Features include stereo output with audio delay, local HDMI loop-out, null-modem-integrated RS-232, and HDMI pass-through. The Bottom Line: As with all models in the J+P lineup, the 725POE 2GΩ/3G+ integrates with any generation of the company’s products. This allows integrators to select the J+P solution that best fits the job, providing an evolutionary, scalable, systems-approach to 4K video signal distribution requirements.